We’re all too aware of how big an impact the economy and the various industrial downturns have had on friends, neighbors, family, and ourselves. Current trends in our society continue to add cost and difficulties to every facet of our lives from a trip to the grocery store to fulfilling the basic need to protect ourselves. As an American, veteran, husband and father I fully appreciate the very basic instinct to protect our families, rights, freedom and country. This instinct is what has lead me most of my life from my time in the service through today. Recently while working with a group of students I rediscovered to a simple fact that I had somehow lost sight of over the years. It’s hard to justify spending a quarter or more of your monthly income on a firearm even if it’s meant to help guard your home. This is especially true when you’re first starting out and there are literally thousands of things you need to buy. As I worked through the class I couldn’t shake a feeling of guilt or irritation that I had taken for granted that everyone could afford a reliable weapon. After arriving home I ran my revelation past my wife who, through her special way, helped reminded me that we faced similar challenges when we were first married. As I was putting away the rifle and pistol I used during the class I noticed in the back the safe, in all of its humble glory, our very first pistol…an old and worn Ruger Auto. I recalled having purchased it to protect my family while I was deployed. At the time we couldn’t afford a “good” pistol or even a new reasonably priced gun (E4 pay didn’t go far then or now). After visiting a couple of stores and a slew of pawn shops I found an affordable “used” handgun that I bought and did a quick test off the bank of the Santi Copper. After a number of misfires and a couple failures to feed my mind started to doubt the Ruger’s reliability and whether I could trust it with the security of my family. While my knowledge then wasn’t what it is today, I knew fixing it was more than what I could afford to pay someone else. With the need to protect my family as a driver, I made the decision to fully disassemble, inspect, and replace all the springs and worn items. It was, at the time, a daunting task. It took twice as long as I had imagined, but with a little patience and some elbow grease the Ruger turned out to be a trustworthy piece that is still serving my family to this day. With that memory now fully refreshed, I decided it was time that I pass on a few of those hard-earned lessons to others who might be a similar position. I begun to mull over the various 1911s, Colts, S&W’s, Chiappas, Berrettas, Rugers, and SIGs in my safe when I had an epiphany: these are all great machines, but not what I needed. I needed a truly inexpensive piece. Something that virtually everyone could buy and, with some effort, turn into something that could be trusted to work. The search was on. As the fates would have it, about a week later an acquaintance asked me if I would look at a Raven Arms pistol he had recently bought that, well, didn’t work. Being a bit of a gun snob (aren’t we all, to some extent?) I had only handled one MP-25 previously. My useful knowledge of the gun was limited to its reputation for being cheap and unreliable. But I realized that the mouse gun fit exactly what I needed for an affordable fixer-upper: inexpensive and with a bad reputation. It’s also often labeled as “Saturday night special” and called a criminal weapon by people who hold a hostile view of our community, so…bonus! So I bought the paperweight from him. In reality the MP-25 is a machine that was produced by George Jennings after passage of the Gun Control Act of 1968 after the murders of Sen. Robert Kennedy and Martin Luther King Jr. The law effectively banned imports of small, inexpensive handguns by requiring foreign-made handguns sold in the United States to meet strict standards of size, weight, materials, and safety features. Standards that didn’t apply to domestically produced firearms. Over its twenty-year production run, over two million MP-25 were made. In an effort to keep costs low, Raven used injection molding and Zamak to manufacture the MP-25 and P25. Upon disassembly and inspection I found that while a simple gun the final fit and finish was — surprise! — less than desirable. Present were numerous machining skip marks, gouges from the slide action, and the action pieces were rough stamped pieces. The muzzle crown was flat with a few nicks and the finish was flaking off. Experience has taught me that the fit and finish can make or break the quality of anything from cars to firearms. Uneven surfaces, gouges, scuffs all can interfere with the operation of any machine. Nicks in the crown will impact if not completely ruin the accuracy of your firearm. Troubleshooting found that the “cam” arm was bent and when acted upon would bottom out against the frame preventing the action from operating. 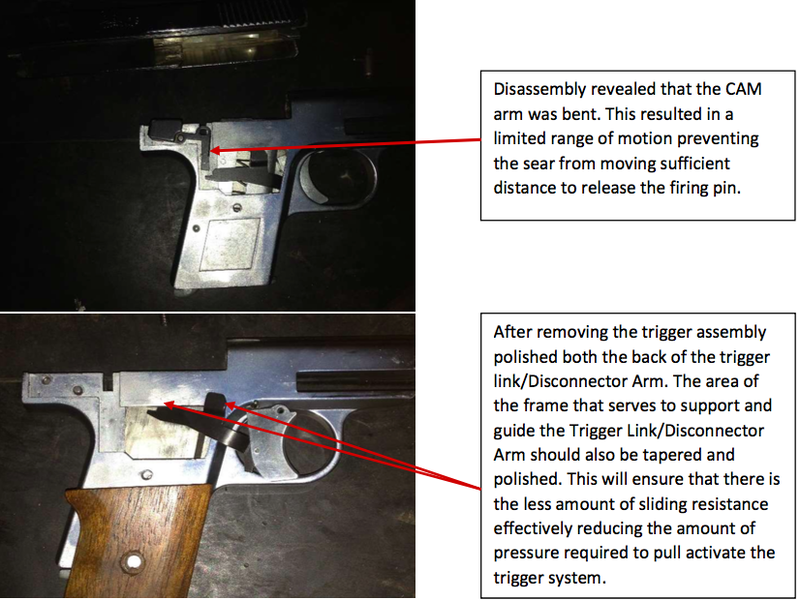 This is the reason the pistol failed to function. A quick internet search lead me to several part brokers but John at Jersey Small Arms Gunsmithing really came through and shipped a replacement cam, sear, and springs that arrived two days later. Having determined the reason for the failure and the overall condition the plan is to replace the failed parts and complete the fit and polish on all surfaces. While waiting for the parts I decided to move forward with the fit and polishing. While preparing jigs for the slide and frame the fates intervened once again. This time it was, “I thought you were going to do an article on an affordable gun makeover…not everyone has all the machines and thingumabobs.” Without a second to reflect on that, the coup de grâce was delivered: “When we started out, all you had was a small tool box and sand paper.” Begrudgingly, I had to admit that once again she was right. To keep with the project theme I didn’t use a soft jaw vice and instead grabbed a couple of wooden shims (most people have them around the house or can pack cheaply) to protect the exterior finish. Having placed shims I mounted the slide into a vice. Remember to tighten the vice just enough to hold the slide, but not crush it. I started by knocking down all the raised metal and high spots, again keeping with the theme I did not use any specialty files and instead choose one of three fine pattern general files (flat, triangle and round). After achieving a relatively even surface that was free of large burs or gouges I then moved to polishing the surfaces. Only remove as little of the parent metal as possible. Focus on burs, gouges, high metal. Do not reshape surfaces. As a baseline I took a few measurements using an inexpensive dial caliber before I started polishing any surfaces. I use these to track the amount of material removed, identify high/low spots and the flatness that’s critical when fitting a firearm. The purpose of polishing a surface (above aesthetics) is to allow the surfaces to basically slide across each other with the least amount of friction while optimizing the lubrication, hydraulic lift, and cooling effects of the oil film. For polishing, there are several different processes that can be used depending on the situation. For this project I went with standard wet/dry sand paper and a repurposed spray bottle filled with clean water. When using paper or emery cloth I prefer a progressive process switching to a finer grade of paper until I reach the desired finish. The additional time required allows for closer monitoring of progress and ensures the least amount of material is removed. Before I start polishing the surface I wet both the paper and working surface. I will continue to spray water on the paper and surface normally when I see material building up. For a backing plate you can use any item that has the proper contour. For flat surfaces I prefer to use old machinist rulers or square. For curved or rounded surfaces I use old clothes hanger, curtain rods etc. I literally have a plastic tote box full of different backing plates of different shapes and sizes. To polish the surfaces for the MP-25 I utilized a flat steel backing plate that I made by repurposing part of an old square I picked up at a yard sale. Starting with the inside of the slide I first address the machining skip and scuffs with 150 grit wet/dry using the metal backing plate to help keep the working surface level and ensure the intended area was contacted. The objective is to take the least amount of parent material not the most. I removed the skips, scuffs and achieved the desired surface shape (for slide tracks ideally you will achieve the flattest surface possible) after I was satisfied the objective was meet I moved to the 320 grit repeating the same process once the smoothest surface was achieved at 320 grit I swap to the next and so on eventually getting to either a 600 or 800 grit finish (the variance is strictly based on the purpose of the firearm, with a general firearm I normally stop at 600. On a competition or special order firearm I go with 800. There have been a few I have gone as high at 1200 but have never been able to confirm a significant deference in the performance of the firearm that would justify the additional work required. On the inside of the slide I focused on the bolt or block including the sear valley and slide rails. I also polished the firing pin hole and channel. Once I achieved the desired finish on the slide I loosed the vice and removed the wood shims. To mount the frame I found that I could use the same shims to protect the finish. Using the same approach as the Slide I cleaned up the gouges, scuffs, and dings then rounded any sharp areas inside the action area. I did this to reduce the contact area of the action which in turn will reduce the effort required to operate the system, resulting in a lighter and more consistent trigger pull. The MP-25 shares a similar simple blow back operation and fixed barrel design as many other small caliber pistols. There are a number of advantages to this design such as ease of manufacture, better accuracy, fewer moving parts etc. However they have a reputation of being very finicky about ammo. Today many manufactures address this during the new building process. However given the age and design that was not the case with the MP-25. To increase the reliability and allow the use of more effective defensive ammo I polished the feed ramp to an 800 grit finish and confirmed the travel path from the magazine to the chamber was aligned. This took some additional file work but will ensure reliable feeding for the life of the pistol. Additionally I throated the entry into the chamber. By removing a small amount of material on the edge of the chamber you allow the cartridge to easily feed into the chamber and the spent case to be easily extracted. To improve accuracy or at least eliminate the risk of inaccuracy I moved my attention to the muzzle crown. As I noted during the inspection there were several nicks that were clearly in the flight path of the bullet when it left the barrel. My initial impulse was to chuck it and cut a new crown. That unfortunately wasn’t within the parameters of this project and neither was a hand crowning tool. Instead I decided that I would lap the current crown and reshape the inside to a confirmed 11 degree taper. There was and continues to exist a trend to utilize a 45 degree taper. I have worked with the 45 degree crown and while I did see the loss in accuracy reported I haven’t seen it at the level reported at least not in the defense range (three to seven yards) I have tested. Conversely I haven’t seen any need outside aesthetics that justifies the use of the 45 degree tapper. At the end of the day I hold to the 11 degree crown unless asked. The MP-25 utilizes a rounded crown. As I’m not using a lathe to cut a new crown I would have to lap the inside and the outside of the crown in two separate operations. Lapping requires a progressive process similar to polishing with paper or emery cloth. I needed more than one lapping tool (when lapping the lapping compound will embed itself into brass so you have to have a dedicated tool for each grit). To create the lapping tool I used a second-hand brass punch I picked up at a flea market and cut it in half. That gave me four working surfaces. On one side I took a flat file and cut in an 11 degree taper on the outer edge. Then, using 800 grit wet/dry paper, I polished the newly beveled surface. This end will be used to lap the inside of the crown. On the other end I took an old drill bit and cut the tip into a concaved surface. I used this bit to cut a concaved surface in the lapping tool. This will be used to lap the outside of the crown to remove the flaking coating and raised material. I checked the frame into the vice with the barrel at 90 degree vertical to the vice and confirmed that it was square. At that point I checked and found that the barrel itself wasn’t perfectly level but was within an acceptable range. Using the coarse lapping compound I apply a generous amount of material on the 11 degree end of the tool and began to slowly spin the tool back and forth until I confirmed that all the raised nicks on the inside of the crown had been removed. I then repeated the same process using the concave side on the outside of the crown. Once all the raised material had been removed from the inside and the outside of the crown I swapped to the fine grit lapping compound and a new tool repeating the entire process. I continued to lap the crown until I reached an almost polished finish. After the replacement parts arrived I moved to polishing the surfaces of the action pieces and sharpening a couple of the edges on the trigger arm. I used 320 grit wet/dry paper to remove the raised surfaces on the firing pin, cam and sear body. A piece that is often overlooked is the ejector. When inspecting it, you want to ensure the engage area of the ejector seats cleanly and tightly to the case head. For this project I gave additional attention to the trigger and trigger slot. I increased the radius of the finger cut on the trigger to allow a more general fit for most shooters and polished the exterior surfaces to ensure the least amount of metal to metal contact. This should help improve the feel of the trigger and reduced the felt trigger pull. One last item I wanted to address was to add a cocked indictor, to do this I painted the guide end of the firing pin red. The red is clearly visible when the firing pin is in the cocked. During re-assembly I used a synthetic lubricant on all moving part of the action and a fine oil film on the barrel and exterior pieces. Range Day was honestly better than I had expected. The MP-25 performed very respectably for a small caliber affordable pistol. It turned out consistent three- and four-inch groupings (I used a six-count grouping). As for the caliber, I think we all agree it lacks the power of other calibers, however from a practical standpoint the low recoil is advantageous for novice or physically challenged shooters. Shooting .25 ACP rounds make it easy to return to target and produce a very tame report, similar to a .22LR. My final opinion: the caliber is less than ideal, however it’s certainly handy to carry. The improvements made the the gun provide a much cleaner trigger pull while greatly increasing the pistol‘s functional reliability. By no means is this a high-end weapon nor should anyone expect it to be. But in its current form it meets the goal of this project…providing a simple, reliable and affordable pistol (usually less than $100 without your labor and parts) for someone who needs an inexpensive firearm. Of course, this same process of cleaning and fitting can be applied to many higher end firearms to improve their basic functions, too. If you haven’t or don’t feel comfortable doing this I would recommend reaching out to someone that can either help you or perform the task for you. Trigger: As found, pivot point, 8 lb. pull. After project, pivot point, 5.5 lb. pull. Post project seven-yard accuracy: 3.0-inch averaged across six targets utilizing Winchester flat nose ammunition. Wow. You realize you put way more man-hours into fixing up this gun than Bryco-Jennings-Raven put into making a whole batch of those things.Why not just buy a Hi Point? I will admit, though, this tour of the MP25’s workings is just what I need, considering my dad wants me to “test” the MP25 he bought back in the 1980s. Hi Points are a bit on the large side, but I agree: either find a Raven that works or get a Hi Point. I’ve been thinking lately why Hi Point doesn’t come out with a micro pistol in .25 ACP? I’m sure they have the skill, but I guess the market isn’t demanding newly made, budget .25 ACP pistols. First Rule of a Gunfight: have a gun. I’ve had to train myself to stop being a gun snob and stop disparaging the “economical” gun choices of those less fortunate than myself. If it goes bang reliably and you can afford it, I’ll refrain from telling you why you made a poor choice and simply (and sincerely) wish you luck and Godspeed. I sold hundreds of Ravens at my gun store from 1988 – 91 and the ones I fired (hundreds of rounds) NEVER jammed. I used to buy them for $30 wholesale (10 or more) and I gave them away for free if a customer spent more than $1,000. We even used to swap out the chrome slides with the blue frames and make two-tones – everyone in town wanted to know where we got those 🙂 . The only problem was they were in the weak .25 ACP and that they were in single action which made carrying with the late style safety a bit of a safety issue if you had one in the chamber (the early ones had a slide safety and safer in my opinion). Today there are some better defensive rounds for .25 so it can be a good gun. I also owned a Baby Browning and Beretta .25 at the time and the Raven shot as well as they did. Junk. Buyer beware. You get what you pay for . I learned the hard way with a similar configuration Davis 380. Jam-o-matic ,Cheap pot metal construction, and parts flew off when firing.. Consider a surplus police revolver or ….??? “Consider surplus police revolver” is little more than a meme at this point. Those revolvers were turned in 20-30 years ago, and are now rusty, dirty and beat to hell, and even in those conditions go for $400 a pop. If I had to defend my family, I’d take a $140 hi-point .45 over a rusty range toy any day of the week. I’ve got a Davis D-32 in my safe that I bought back in the 80s when I didn’t know any better. Its clunky, ugly, heavy and underpowered but its always fed everything I’ve put in the magazine and fired every time. Its accurate enough at conversational distances to do minute of bad guy. I also have one of the Davis .32 derringers. Trigger in the triple digits, but not much can go wrong with it. I actually carried the derringer as a back up for a few months when I started with the sheriff in 92 because I didn’t have anything better. Then I bought a .25 Beretta Model 21A which I still have. Except Trabants were very reliable. I purchased my MP-25 Raven new and considering the short barrel it is very accurate for what it is. At 20 yards I still get a shot group of 6 inches low and to the left if You don’t allow for the bad sites. I have put 200 rounds through it and never had a jam and always get the same results. It is a cheap semi-automatic that works well just make sure to keep Your hand low on the grip so You don’t pinch the skin between thumb and trigger-finger from the slide. One Christmas (many years ago) I bought a number of these and gave them out as stocking stuffers (they were that cheap). The catch: I bought the most horrid color combinations possible. (Chrome with pink grips, for example). I love seeing stuff like this. The tinkerer in me enjoyed every step noted. For time and money spent, someone could get a p64, makarov, older cz, tt33 type knockoffs, etc. And those are trustworthy, well built, and go bang 99 percent of the time. I feel this would be better solution for a person on a tight budget. Not a terrible piece of junk that an experienced gun guy customized, to prove it can work. Plus the mil surps will go up in value eventually, while these potmetal junk pieces are worthless. I guess you CAN polish a turd!? The Mythbusters also proved that was possible… Honestly kinda blew my mind. For sale, gunsmiths special, Jennings 22. I no longer have the original box with the detailed instructions on how to throw it. I bought around 30 Jennings .22 autos in 1989/90 and we had many coming back to my store for ejection issues. Turns out that there were thousands made with poorly machined extractors. The company send me extractors for free and we installed them – the little pistols fired perfectly after that. Nice write up on rehabbing an old paperweight. Another idea for a dirt cheap pocket gun: the old Deutsche Werks Ortgies pistols in .32ACP. Generally sub $200, often just a tick over $100. And a lot better craftsmanship than the Jennings, Ravens, and so on. I picked up an old RG42 .25 pocket pistol at a gun show that the seller wanted $40 for- It was “broken” he said. Turns out he just didn’t know how to reassemble it. Damned thing shoots like a dream, is pretty accurate, and fits anywhere. Don’t knock those old pocket pistols. I agree, the RG .25 isn’t a bad gun. I have had RG .38 snub noses since the 70s (still have one) and they always worked, There’s nothing wrong with a below budget gun. I would bet that the guys that keep saying that these “cheap” guns will blow up either: A) are under 40 years of age, B) never fired one, C) never even saw one, or D) put a +P in one and had an issue. I have fired +P in an RG .38 but only a couple of times and without incident, regular ammo is not an issue. Fixing them up is fun and you can buy a “broken” gun (RG, Arminius, Davis, etc.) for under $30 sometimes, Gun Parts Corp. still has some parts for these but good luck finding any grip screws for the revolvers, for whatever reason they are hard to find and its not like they fall out. No grip screw? Try black tape! Then you have that 1970s Saturday Night Special look! Great article, always appreciate someone giving some fine-motor tech tips. Good stuff. I too would warn away from any zinc/pot-metal castings, and, for the $$$ or $ would definitely buy a Hi-Point, or a Surplus FEG or Polish P64 or P83 in 9 x 18 Makarov. All of these will (despite the TLC in the OP) outlast any Jennings. Buy all the weapons you can afford, though. Buy a few you can just barely afford, and apologize to the wife later. The Jennings designs are not terrible, it’s a materials problem. I bought a Raven 25 from my gun trading partner just because it was cheap $30 I think and something to play with. It would work fine and then it wouldn’t. Good enough to keep messing with and it finally dawned on me the slide was dragging on my thumb and finger. Changed my grip a little and it works every time. I have way better pistols but this is just fun to shoot once in a while. Had a Jennings 22 and it was complete garbage and threw it away. In a fit of frustration I threw one of those Jennings .22s in the Ohio river. I have a few Saturday Night Specials. One is an AMT Backup .380 that I never miss a chance to blab on about endlessly (re: any of my other posts). I’m not sure I’d consider it a Saturday Night Special, but the government sure did because AMT got on the list of “Ring of Fire” companies. The other is an Intratec Protec Mod.25. That one is DEFINITELY a Saturday Night Special. But even though it’s pretty cheaply made out of zamak, it’s got a nice look and feel to it. Partly due to the legacy of the CZ-45 design, but probably because Intratec did have some good ideas. I have no problem with having to do a basic fluff-n-buff, polish a few surfaces, etc, on a cheap gun. But if you have to get out files to make the gun work, you’re putting in more effort than the factory did to make the thing. I’m definitely no gun snob, in fact I love cheap guns. I recently picked up a pretty clean 1991-vintage stainless Taurus 82 from the used gun case at my LGS for $160. Yeah, it ain’t no Colt or S&W, but for only $40 more than this Raven, something like that would be a much better first gun for someone on a tight budget. That’s actually one of the reasons I bought it – at that price, I figured I’d pick it up and hold on to it with an eye to passing it along to someone who needs an inexpensive house gun at some point down the road. Merely in an attempt to dispel the myth that a 22LR is more powerful than the 25ACP, please check out “Ballistics by the Inch”. Data for similar weight bullets in similar length barrels in similar types of guns show that the 25ACP presents higher muzzle energy. Additionally, with a low-energy bullet, penetration is paramount to effectiveness. From that aspect, a typical jacketed 25 is superior to a 22LR lead bullet. As an aside, Robert Kennedy, Ronald Reagan, James Brady, Thomas Delehanty, Timothy McCarthy, and innumerable others of less notoriety, have been laid low by a mere mouse gun. Firearms instructor Paul Harrell made an excellent video comparing .25 and .22 from tiny pocket pistols. He’s got a great professorial style, check it out. Of all the economically affordable pistols. I always recommend the Hi-Point series. They’re ugly, heavy, low capacity, and they work. The parent company Beemiller, Inc. stands by their products too the point that you can cut one in half and they’ll replace it. They’re rated for +P ammunition and come in .380 Auto, 9x19mm, .40 S&W, and .45 ACP. Their warranty service is no questions asked. It is life time and attached to the gun and not the owner. Do I own one? Nope…. I’m lucky enough to not be in the economic situation where I can’t afford better. But I do recommend them and I’m no snobbish towards them. One sits in the back of my safe, bought new for $40 and still never been fired these 30+ years later. I bought one wayyy back and worked to burs out and it runs reliably for 3 mags then becomes too fouled. I gave to to my Mom who won’t turn lose of it. It runs the little Hornady XTP reliable and I’m knowing its a hit or miss on expansion but so be it. Its all I can get her to carry so I’m happier than the option. If you’re interested in Saturday Night Specials/low cost firearms you should checkout my website. We love guns and are a members generated forum. Don’t let the gun snobs fool you. SNS guns are fun to shoot and work on. With all this talk of Saturday Night Specials why has no one mentioned Iver Johnson Bicycle & Iron Works? They started the market for cheap tiny pocket guns. One of my favorite revolvers is an Iver Top Break in .32s&w 3in barrel. They are a brilliantly simple mechanism that will hide in even your tightes jean pockets. A cyclist friend of mine in Fitchburg MA was a collector of Iver Johnson Bicycle parts. Collected and sold them on eBay. Thanks for the memories..
Great article. I bought one of these at a Gibson’s in nickle plating in Utah back in 1980. I carried the darn thing all over the place, and yes it did have the same cam arm issues you describe. I found that if I ensured the wooden grip was tightened down good and I squeezed it nice and hard, the gun shot every time. My son loved it and carried on many backpacking trips into the mountains, and even shot trout with it in the shallow mountain streams to cook over the fire. he still has it and loves the thing. This article makes me want to get another one. At $140 on sale, my Hi point 45 caliber pistol was a great deal. The performance has been great. I’m ordering a flush fit magazine for it. Then I will see how it can be carried consealed. I have an old Galesi .25 ACP that I used to shoot a pissed off oposom in sister in laws barn. Shot it 7 times at about 4′ and all it did was get madder! Finally beat it into submission. With a 2×4 ! .25 isn’t reliable for killing anything larger than a mouse or maybe a goldfish!